For the third straight year, I have trekked to a far away bakery for the Fat Tuesday special... The Paczki. This year, I decided to give Bennison's Bakery a try. Located in Evanston, it takes a good 40 minutes or so find the bakery if you are driving in from the city. And, once you get there, you may be greeted by a long, snaking line like I did. But, it is worth the 30 minute wait for your paczki. This year, Bennison's is offering nine different flavors with a few "new-school" paczki, which utilize fresh fruit and homemade whipped cream. The prices are very fair at about $2 per paczki. Unfortunately, they are not taking anymore pre-orders today so don't even try. I think the distance is keeping me from giving it a perfect rating and also the availability. Despite advertising the nine flavors, luck is what determines what will be available when it is your turn at the counter. I was lucky to get some of the fresh strawberry, but about a dozen customers were left disappointed. Regardless, this paczkis are amazing, and I highly suggest people get in line sometime today before they run out! Enjoy! It was a tough decision for me, but I eventually eliminated the nine flavors down to just four. This year, I decided to try their two "fresh-style" paczki, the fresh strawberry and fresh banana, and the two more traditional ones, apricot and raspberry. If you have never had a paczki before, this is a special Polish-style doughnut that is classically served on Fat Tuesday. They are special because the yeast dough is allowed to rise before being deep fried on both sides and injected with many different fillings. The doughnuts are then either dusted in powdered sugar, rolled in cane sugar, or dipped in a glaze. These paczki were entirely different from the ones I had last year. These were light and airy and more doughnut-like rather than bread-like. I personally enjoyed the more traditional ones because the glaze and sugary fruit filling reminded me more of a childhood doughnut rather than something healthy and fresh. The fresh ones were also good, but the whipped cream was a little much and the fruit more lacking. I think they needed to add more fruit because the cream sort of overwhelmed the fruit. 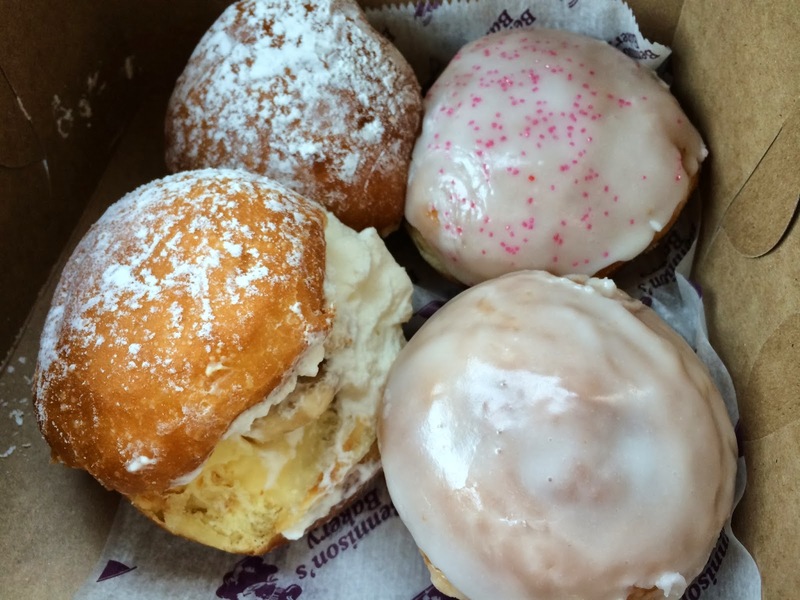 At about $2 per paczki, you can easily afford to purchase more than one. The problem then becomes eating them all. Happy Fat Tuesday! - Give yourself plenty of time at the bakery. It may take 30+ minutes if you didn't preorder. - Pay the meter! I saw cars getting tickets today for street parking. - Don't expect to get all the flavors. They run out constantly and are struggling to keep up filling orders so you may need to wait a few minutes or longer for the next batch to finish.